Really interesting I thought, because so much that looked the same at first glance was in fact different. 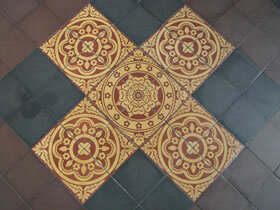 Look at the three images of the patterns I found along the centre of the tiling (below). What is the same about them and what is different? 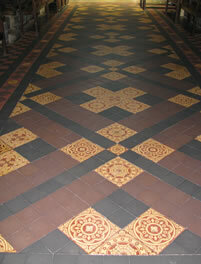 Now look again at the picture of the whole of the main tiled area. It was made from nine complete patterns each like one of the three above. At the ends there were partial patterns, both like the one in the foreground. 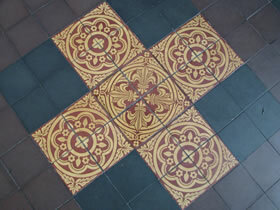 The pattern was surrounded by a rectangle of black tiles with some further tiling beyond. 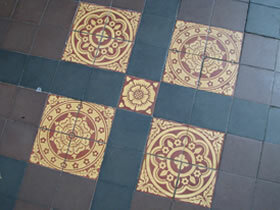 How many of each type of tile are included in the pattern? Can you reproduce parts of the pattern? Can you extend it sideways? Translations. Reflections. Real world. Interactivities. Symmetry. Visualising. Compound transformations. Practical Activity. Tessellations. Rotations.